The countdown to Christmas is almost over. With just a few days remaining, those who are hosting family and friends most likely have their menus set and are busy preparing for a festive occasion. But perhaps there is time–and room on your breakfast table—for a special start to the day. A wonderful woman who babysat my young boys nearly a decade ago passed along the following sticky bun recipe to me. I pull her hand-written card out of my recipe box when time is short but I want to serve a crowd-pleasing coffee cake. The recipe seems a bit bizarre both in method and ingredients. Yet the end result tastes just like a sticky bun should. And your kitchen will smell as good as your favorite bakery! Note: For a thoughtful gift, mix the pudding, sugar and cinnamon and store in a quart-size, zipper-top bag. Put pecans and/or raisins in a separate bag. Place both in a gift bag with the frozen dough and instructions. (Make sure they transfer the dough to the freezer until ready to prep!) I have included a set of instructions below the recipe so that you may print and cut out if you would like to give to a friend. While the original recipe calls for a cup of raisins, we enjoy the crunch and flavor of pecans, and I think a half a cup is the perfect amount. Feel free to use either one or a mix of the two. The recipe should be prepared before you go to bed and baked upon rising. 1 (2-pound) package frozen dinner rolls (Rhodes or Rich’s brand, for example; you want to purchase the DOUGH, not the precooked rolls.) Can also use 2/3 of a 3-pound bag. 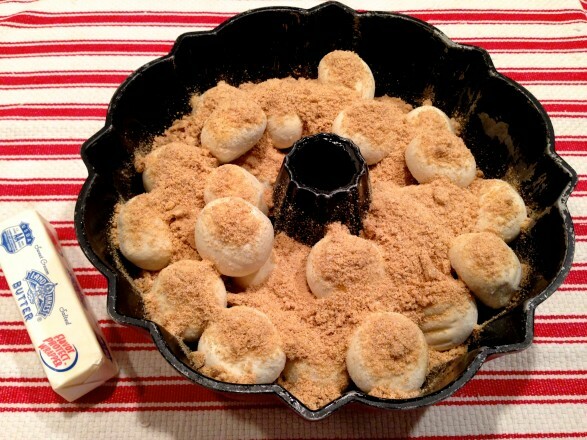 Combine the pudding mix, brown sugar and cinnamon; sprinkle over dough. Cut butter into pieces and dot over the top of sugar mixture. In the morning, preheat the oven to 350 degrees. Remove plastic wrap and bake for 20-30 minutes or until the sticky buns are cooked through and a bit crusty on top. I like to place the Bundt pan on a baking sheet just in case there are any drips over the side. Baking time may be longer if you are using a light-colored, non-stick pan. Allow to cool for 5 minutes in the pan. Place your serving plate on top of the Bundt pan and invert, holding platter and Bundt pan together, so that the sticky buns come out nicely onto your platter. Tip: If you don’t seal the plastic wrap to the side of the Bundt pan before going to bed, the dough may rise well above the top of the pan by the time you wake. Not to worry, simply press down on the wrap-covered surface until the dough is at the same level as the top edge of the pan and proceed. Following are the instructions to cut out and give along with the pre-mixed sugar mixture, pecans and frozen dough balls for a thoughtful gift. Just make sure the recipient stores the dough in the freezer until ready to use. 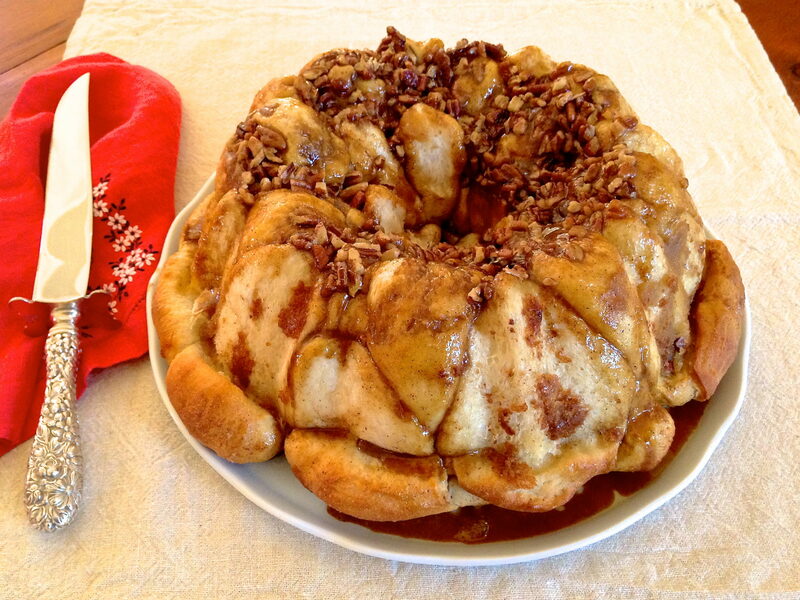 Before you go to bed, sprinkle pecans in a well-greased Bundt pan, and evenly arrange the frozen dough balls on top. Sprinkle the dry mixture over the dough, shaking it down just a little. Cut one stick (8 tablespoons) of butter into pieces and dot over the top of the sugar mixture. In the morning, preheat the oven to 350 degrees. Remove plastic wrap and bake for 20-30 minutes. I like to place the Bundt pan on a baking sheet just in case there are any drips over the side. Note: If you don’t seal the plastic wrap to the side of the Bundt pan before going to bed, the dough may rise well above the top of the pan by the time you wake. Not to worry, simply press down on the wrap-covered surface until the dough is at the same level as the top edge of the pan and proceed. Oh Ann, another fun keeper! Merry Christmas to you, too, Terra! I will think of you enjoying your mom’s sticky buns on the morning of the 25th! This looks soOoooOoo good! I just did all my grocery shopping and now I want to go back and get frozen rolls 🙂 Thank you for including my blog on “Other Recipe Sites”, I am truly honored. Wishing you and your family a wonderful, blessed Christmas! Best wishes for a joyful Christmas to you, Audra, and I hope you make it back to the store! It is truly my pleasure to include your blog on my site. You have so much to offer, in terms of food and beyond! Julie Stover, feel free to make these. I’ll test them for you! That is interesting, Margot…and certainly unfortunate! We still have Rhodes so I wish I could share! An alternative I might experiment with would be to use the equivalent amount of purchased bread dough and roll it into small balls. I think I would cover and refrigerate overnight (since it wouldn’t be frozen), and then allow to sit on the counter for an hour or so before baking. You just want the dough to be at about the same level as the top of the pan. Perhaps I will try this one day, too! Thank you, Ann – I think I will try that! I made these last night for Christmas morning breakfast…my family loved them! Thanks for the great recipe and quick breakfast…Blessings! So glad you enjoyed, Katherine! Thank you for letting me know and I hope you had a delightful day! I made these but it was too much for my bundt pan and as they baked thy rolled off the top of the pan and landed all over my oven. Baking them 25 minutes was not nearly enough which left them quite doughy in the middle. I’m sure this idea is a winner though and will make some adjustments and try again! Oh Lynette, I am sorry that happened! Coincidently, I was at a friend’s house the day before Christmas and she showed me her Bundt pan which is much smaller than mine. I am going to make a note on the recipe as, apparently, there are two different size pans. One of the challenges of writing these recipes is the baking time as ovens vary so much. I will continue to make notes to help everyone have success with the recipes and truly appreciate your feedback! The grocery store ran out of the Rhodes large package of dough/rolls (I wonder why??). So, I used Sister Schubert dinner rolls. Two 12-packs worked well and the dish was a major hit at our brunch. Thank you!!! Coincidently, someone else told me the same thing! Also, I happened to be at the grocery store yesterday and bumped into a friend who literally had a pack of frozen dough in her hands. She showed me that they only had 2-pound packs, which I had never seen before. This size would be perfect for those with smaller Bundt pans. Conversely, for those with smaller pans and the 3-pound package of rolls, removing 10-12 dough balls would avoid overflowing the pan. Thanks so much for your comment, Amy! I made it to accompany sweet ham! GONE! And got requests to make again and again! My son called me the next morning to see if I had a little piece left! Told him I ate it!! Loved the recipe! Family favorite already!! 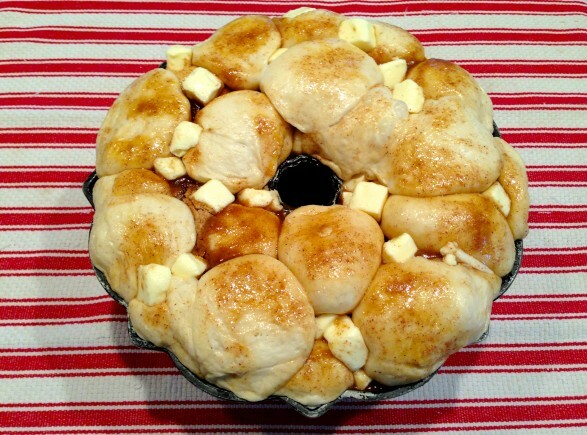 One more thing…I made them using 32 Pillsbury dinner rolls and came out great! I will have to try it that way the next time, for sure! Is there a way to make these without the bundt pan? 1 layer in a casserole maybe? I haven’t tried it this way, Carol, but I think it would work just fine. The dough balls are rather small when frozen, but they will expand a lot overnight. The hole in the middle of the Bundt pan allows the center to bake through a bit more quickly. So, just make sure you have a dish that is not too narrow despite what seems like not a lot of dough at first. And check a little early as the proportions of the pan could alter the suggested cooking time in either direction. Hope this is helpful! Since we did gifts, etc last week when our daughter and son-in-law were in from Oregon, this Christmas morning was relaxed and low key-perfect leisurely breakfast opportunity. Having no Bundt pan, and mindful of the benefit of a pan with an open center, I used an angel food pan. These are VERY sweet and sticky-my 24 year-old son awarded them a “perfect Christmas morning breakfast” title-and then noted that they really should be a “very seldom to preserve waistlines” dish. Probably sad but true-but we enjoyed them this morning! Enjoy the recipe, Beverley, and your trip! What fun! Thank you, Becca! I didn’t realize there was such a holiday…but it sounds terrific to me! I won’t say how long I have been making these for Christmas morning; we use dark brown sugar and butterscotch pudding. So glad to have another recipe to use; light brown sugar and vanilla pudding. one batch is never enough for my family of 7. my brother has made them flat to take to work as everyone wants some of the “gooy” stuff! I also cut the rolls in half before putting them in the pan. I have made a butterscotch version, too, although this is my original which I make most often. Your suggestion to cut the rolls in half is so smart. What a great way to get the gooey stuff all mixed in! It appears Rhodes is not in business. Try Bridgeford. I find them at Stater Bros. In Ridgecrest, California. They are dough balls. They are with other frozen bread dough. We take it to church on Sunday. It’s great for coffee hour. Hi Elizabeth, They seem to still be available in at least some stores (I’m on the east coast) and I found them online, but a similar frozen dough can absolutely be used. Thank you for your recommendation. This recipe is a perfect way to start a Sunday morning, and I’m sure it’s a hit at your church coffee hour! Is it the end of the world if I have the instant pudding and not the cook and serve? I’ve always made it with the cook and serve variety so can’t say for sure what the outcome would be. If you try, I’d love to know how you make out. Can you use an angel food cake pan? I haven’t, Tracy, but they’re so similar that I can’t see why not! I have a similar recipe which we call Monkey Balls. The problem with the angel food pan is that the syrup will run out of the bottom of the pan. Beware! Thanks so much for mentioning, Trudy. I had not thought of that small but important detail! So happy to read your comment, Marita!